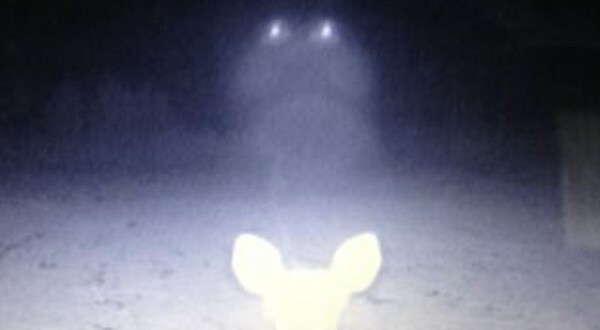 Photos showing unidentified lights captured by a couple’s trail camera in Jackson County, Mississippi made considerable headlines on Friday, April 4, and continue to make headlines. Since then, a couple possible explanations have been offered. The most mysterious photo shows a deer in the foreground, with two apparently aerial lights in the background. The owners of the camera originally pointed out that the lights look like a car’s headlights, but there is reportedly no road in the direction of the lights. The lights also appear to be well off the ground. 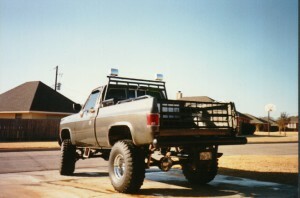 A truck with two spotlights. I work in animation and special effects, and I’m a big photo geek. I’ve watched carefully the photos of these supposed UFO lights. It seems to me that these lights are actually the reflections of the deer’s eyes in the lens of the camera. You can see this aberration in many photos and films where the bright lights produce and mirrored ghost picture in the lens. The weird shape appearing is easily recognizable as what some water on the lens can produce. And finally, the light projected on the deer and the ground, to me is just the flash of the other infrared camera. If you compare this photo with the other one with the deer facing the camera, you’ll notice that he’s in the same position. As much as I believe in UFOs, I think this case is only a misinterpretation of lens flares and reflections. 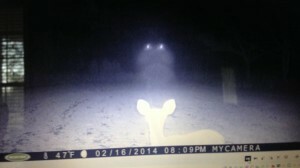 As the video shows, the deer in the photo’s foreground is most likely to blame for the “UFOs.” Do you agree with this theory? Share your thoughts with us on the Open Minds Facebook page, or by posting a comment below. 1.The infrared light on the camera should not be illuminating the ground, yet the ground is illuminated. How did that happen? 2. The lights seem, at first glance, to be in the right place for the deers eyes. Yet if you take the lights and superimpose them over the deer, the lights are a bit too wide for the deers head. Does that normally happen with reflections? 3. What about the light under the “Headlights”? If the lights are a reflection of the eyes, then that could be the reflection of the neck, of course. If so, where is the deers body reflected? Looks amazingly like the “headlights” on the UFO filmed over the gulf in Pass Christian in 2014. Don’t think they were hunting dear that high up. Sorry, but I consider this “Case Unsolved.” After 22 years in USAF Intelligence working with photos and analysis, I would do more research before I close a case as solved. Just a thought. Anybody check for 4×4 off-road tire treads to see if it was poachers in a big rig?